The other week, the infamous and much-derided Green New Deal was voted down in the Senate and with it the dreams of a Federal spending party for tackling climate change. But maybe its advocates have been going about this the wrong way, engaged in political solutions and international treaties such as the Paris Agreement. To anybody with insight into political decision-making — or even a healthy skepticism about the miraculous workings of the political apparatus — trying to navigate such a minefield of special interests and entrenched divisions must have seemed like a fool’s errand. Trying to address externalities and global tragedies of the commons through a political prism might not be the best option. What if climate activists, striking school children, television pundits, New York Time columnists and others — here affectionately referred to as Climate Warriors — joined forces and, on their own, tried to mitigate the harmful consequences of climate change? Apparently, climate change induced natural disasters will still be with us even if we ceased emissions tomorrow. As such, we require protection — those least able to literally weather the storm most of all. As Climate Warriors’ preferred route for transforming society — i.e., politics — has faced a setback, perhaps there’s a more voluntary and individual way to offer assistance to those facing potential climate-related damages to life and property. Catastrophe bonds (“Cat bonds”) is a fast-growing segment of the corporate bond market that emerged out of Hurricane Andrew in the 1990s, when property damages bankrupted several insurance companies. Insurance companies of the sort that you and I usually interact with pool risks across many customers so as to afford payouts for the unlucky few that are affected by damages. To protect themselves from worst possible outcomes, they typically transfer off some of their most extreme risks to re insurance companies – essentially, insurance companies’ own insurance policies. You might think about it as “capping” risk exposure at a pre-arranged level by paying reinsurance firms a fee to accept damage claims above a particular level ( Warren Buffet’s Berkshire Hathaway has large such business; other market leaders include Swiss Re, Munich Re and Hannover Re). Cat bonds provide the same service as this traditional reinsurance business through publicly traded financial markets instead. Much like securitization in other areas, a Cat bond complements this firm-to-firm reinsurance business by allowing insurance companies to sell off risk straight to financial markets. Investors, similarly, have recently been much more willing to buy them since a Cat bond’s value and interest rate payouts vary with natural disasters rather than business cycles or financial crashes. 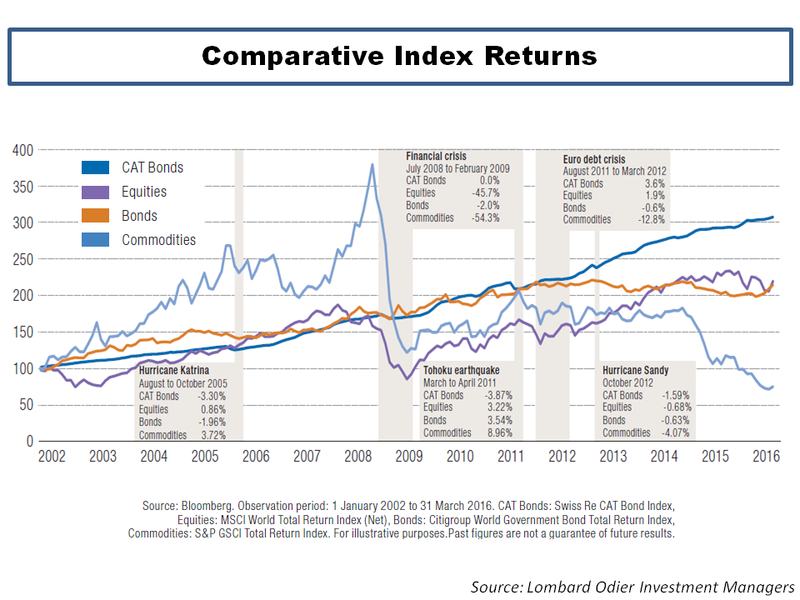 Indeed, a standard basket of Cat bonds have delivered remarkably stable returns, even outperforming the S&P500 since 2006 (measured very opportunistically). Their two prime virtues from an investment point of view are that they are virtually uncorrelated with other kinds of investment risk (stocks, bonds, FX), and their volatility is microscopic. 1) An insurance company offers up (“Cedes”, “Sponsors”) a well-specified risk for a section of its claimants, packaged into a bond with a face value of, say, $100m. 2) A group of investors (through an investment bank or other vehicle) puts up $100m in a Special Purpose Vehicle that holds nothing but the Cat bond funds (usually invested in short-term CDs or government bonds to ensure some minimum real return). 3) The ceding insurance company then pays regular premiums into the SPV for the insurance protection it now receives from the bond. 4) For the duration of the Cat bond — typically 3-5 years — the SPV sends its investors regular interest payments if no event takes place. Should the “Trigger event” (the event specified in the contract, such as earthquakes floods or droughts of a certain severity) occur, the losses are deducted primarily from the set-aside funds and made instantly available to the insurance company to pay for their clients’ damages. The great benefit for the insurance company is that the money is set aside, ring-fenced, and instantly available should the terms of the contract be fulfilled (i.e. damages of a certain kind and magnitude). For investors, the construction offers a diversifiable income stream, uncorrelated with other markets, and typically yields a few percentage points above market rates of similar duration. Even the huge storm damages in 2017 from Hurricanes Harvey and Irma did nothing to dissipate this emergent market. A recent article in Bloomberg reported that the Cat bond market have kept growing rapidly as climate change is believed to cause even more extreme weather in the future. How Can Cat Bonds Mitigate Climate Change Damage? The similarities between damages from extreme weather phenomena and climate change should be fairly obvious. In both cases we are talking about out-of-the-ordinary events, with damages and consequences that many communities are typically not set up to protect against. Dealing with the costs of climate change that Climate Warriors and scientists say will inevitably come, could thus be conveniently done through the Cat bond market. And the best thing? It requires no political negotiation, no global haggling of rights or responsibilities and no expansive packages navigated through Congress. It requires Climate Warriors to simply put their money where their mouths are — and start buying Cat bonds. This is how it could work. AOC, Paul Krugman, Naomi Klein and Elizabeth Warren create the “CW Cat Non-Profit” and invite all their staff and supporters and the parents of the striking European school children to join. There could be membership fees and grand events filled with eloquent speeches, but the key point is to amass lots of funds through donations, and start buying Cat bonds like crazy. The purposes are twofold: assist the growth of the Cat bond market and become a large enough player so that they can start setting terms from their “upstream” partners in the insurance and reinsurance business. If these activists and pundits truly fear the outcome for which they are protesting, and if they truly believe the grand and sharp slogans of their banners, it shouldn’t be a big problem to start pooling money to fund inevitable damages from the very thing they detest. Quick back-of-the-envelope calculations also ensure that they could quickly reach a large share of the Cat bond market. Currently, there are Cat bonds outstanding worth $37.9 billions with new issues of some $10bn per year (some of which is simply re-investment of old bonds). Adding up a 25%-salary contribution by the hundred or so politicians who have publicly backed the Green New Deal, a one-off $200 contribution by the 2m or so participants of the last month’s #FridaysForFuture (double it to include non-attending friends, relatives and families) and add a one-time 25% wealth transfer by outspoken and well-off proponents of the Green New Deal scheme such as Maher, Krugman, Warren, Gore, Harris (naturally, they wouldn’t object…? ), we’re already at a billion dollars – enough to entirely buy out the March issue of Cat bonds . With some extra cash from the $12 billion that environmental charities raise every year, and the generous support of the very vocal supporters of the Green New Deal, the “CW Cat Non-Profit” is soon on track to become the largest player in this business. Now, if this is just a fund-raising attempt, why couldn’t Climate Warriors just as well pour their money into renewables, putting up solar panels or invent smart electricity grids and green car engines? An obstacle for Cat bonds has been their limited maturity of 3-5 years, after which they fall due and the risks revert back to the insurance companies. One reason for this is that risk-averse investors have been reluctant to commit funds to longer terms than that, partly as the combined Trigger event risk rises very high; the 30-year likelihood of at least one Magnitude 6 earthquake in the San Francisco Bay area is estimated at 98% . By emphasizing longer terms , CW Cat Non-Profit can induce market participant to expand bond durations. Climate Warriors are excessively concerned with future generations , and losses — in contrast to regular investors — are to be welcomed as a needed redistribution from well-off donors to those literally affected by climate change. They therefore have much lower risk premia and, not running a for-profit, consequently require much lower rates of return for holding climate risk. As long-term investors, not primarily set on earning money for themselves, CW Cat Non-Profit does not value the option of withdrawing the assets for consumption needs, i.e., places no particular price on the liquidity of the Cat instrument. As is the case today, the Cat market is still immensely small and not as liquid as many other financial markets. For ordinary investors, this kind of investment therefore demands a liquidity premium, a higher-than-otherwise interest rate. Not for CW Cat Non-Profit, and they thereby become a better client for bond originators, as CW Cat Non-Profit is willing to take on more risk for less cost. Since the CW Cat Non-Profit has no interest in earning investment return for itself, the revenue streams generated can be fruitfully invested in social projects or infrastructure improvements — or simply re-distributed to those without insurance policies that the organization finds worthy. Indeed, should it become a large enough player on the global Cat market they can likely offer premium reductions in exchange for payouts to refugees of climate change, contingent on, say, UN status. For Climate Warriors, the defeat of the Green New Deal should not be gloomed over, as it offers its proponents the ability to put their money where their mouths are and start alleviating climate change damages. Provided, that is, that they can overcome their hostility to financial markets. Matt Bracken gives his take on the social media unpersoning epidemic sweeping across the internet.